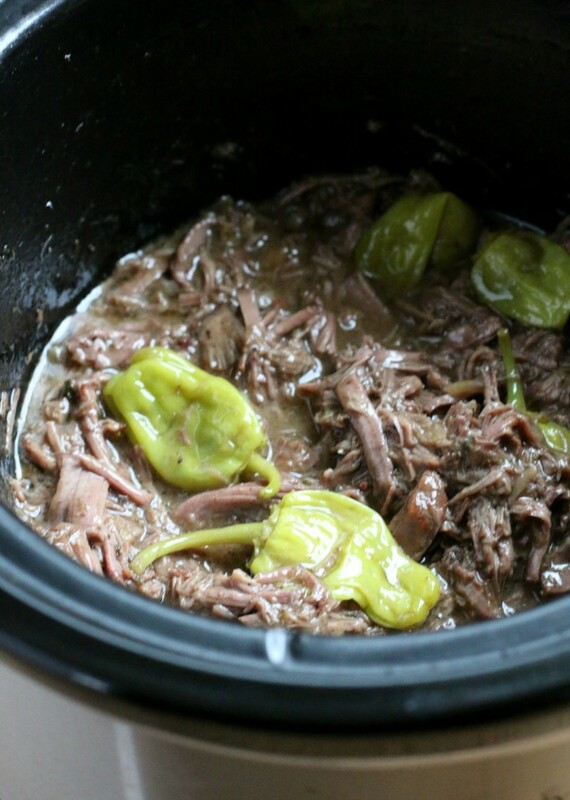 I have been doing this blog for 2 years and I can’t believe this was my first time to make this famous Mississippi Pot Roast. I bet I’ve seen variations of this recipe thousands of times on pinterest. Now before you judge about how fattening this recipe is, I’m not forcing you to make it. And I do not recommend anyone eat this way everyday. That being said, THIS WAS TO DIE FOR! I will probably only make this rich dish once a year, but I will be drooling every time I think about it. I had planned to put this shredded meat on buns for serving. But after I shredded up the meat and tasted the buttery sauce that was self made, I knew I had to serve this on rice. If you grew up eating butter on rice as a kid, you will understand the need to serve this dish on rice. Season the meat with pepper (I wouldn't salt it, plenty of salt in this recipe already). Set a large skillet to medium-high heat. Add the oil, when the oil is hot, add the roast. Brown on all sides. Add the roast to a 4-quart or larger slow cooker. Add the ranch packet and onion soup packet on top of the roast. Add the stick of butter, and peppers on top of the seasonings. Cover and cook on LOW for 8-10 hours. Do not open the lid while the roast cooks. Shred and serve on rice or mashed potatoes. I used 1 stick of salted butter. The sticks of butter in our area are short and fat. 🙂 unsalted butter would work just fine if that’s what you have. Thanks for your quick reply!! Going to try this weekend. That sounds awesome! I love your ideas. I need to put that on the menu this week! 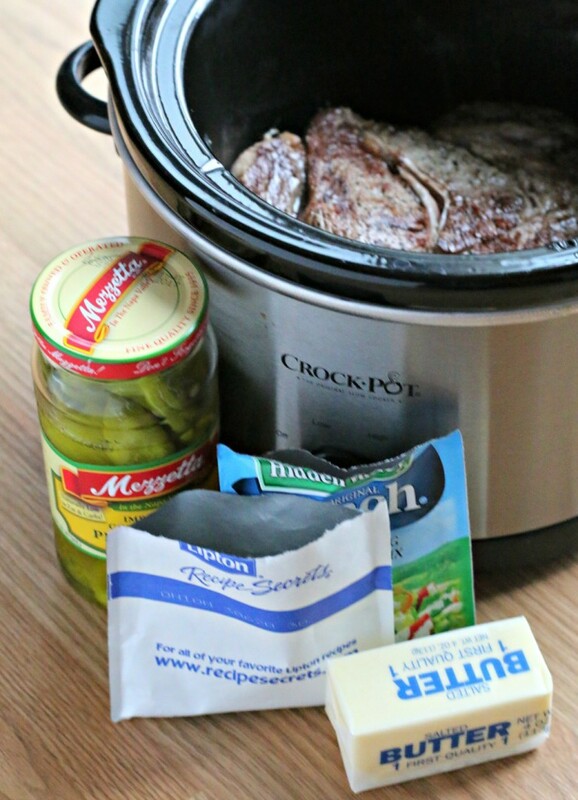 I love using my crock pot and I love pot roast so this recipe sounds fabulous! This sounds delicious! Pinning and I’ll make this for the first time too!! I make this all the time, but instead of the onion soup packet, I use Au Jus. I still use the packet of ranch. I also use a whole stick of salted butter. As my grandma would say about unsalted- “you might as well be eatin’ paste” lol. The MPR is always a hit at our house. Thanks for sharing. Sounds good. Now I’m torn between the onion soup mix or Au jus along with ranch, butter. Not sure which to go. Help!!! It was so hard for me to choose too. I love the onion soup mix, it added flecks of onion to the sauce and tasted great! I did decide to use the Ranch Dressing and the Onion Soup. The roast was wonderful!! Saw this recipe this morning and I have already changed my dinner plans! I hope my family is just as excited when they find out I substituted this yumminess for their Sunday pasta. Something tells me they aren’t going to be too upset…lol. Yum! I needed something new to try with pot roast. Wish I had gotten here before I went to the store today! Made this last night. It was so good. I added portabella mushrooms to the top.the next time. I may try to cut down on the amount of butter by 1/4 stick. Adding a package of onion soup sounds great too, why not all 3? I served it over noodles and we loved it. Cooking right now. Halved butter and added splash of red wine. Will serve over ww noodles. Thank u 4 what will b a great meal!! I made it today. The taste was wonderful! A little on the salty side. I used unsalted butter and did not salt the mashed potatoes. I will definitely make it again, but I may cut down to half on either the onion soup mix or the ranch. This looks so yummy! I’ve never tried it and the recipe itself is famous. People swear by it once they make it. Should the roast be thawed or can you use frozen? Do you need to ad any water or juice? This was definitely “to die for”. I used 3/4 stick of butter, added a splash of wine, prepped the meat with ground pepper and thyme, and left out the peppers. When it was finished cooking there was a delicious sauce. I made the mistake of cooking it on high. I noticed my error after four hours, but everything was fine. I just needed to cook it on low for one more hour. So, if you don’t have 8 hours it cooks well on high. My husband grew up eating a lot of pot roast dinners and he said this was the best he’s had! TRY IT WITH PORK ROAST. AWESOME. Trying this recipe for a surprise dinner for my wife. I added beef stock and some whiskey to the mix of ranch powder and onion soup mix. 2 more hours to go, and my mouth is watering!! Carey, interested to know how it turned out with the whiskey! You don’t need to add water with the powdered packets of ranch and au jus? I am going to use a pork roast. Does anyone know if the cook time needs adjusted? Jessica, just curious how this turned out with pork? My husband can’t eat red meat and I am dying to try this recipe. Any suggestions? OMG! This was so good my husband wants me to make it again! The only changes I made were because my roast was frozen I put some of the juice from the peppers and some Shiraz wine on the bottom of the pot so it wouldn’t crack (which also meant I couldn’t brown it, but it was still delicious) and I used Lipton Onion Mushroom Soup (it’s what I had in the pantry). My English Cut Roast was only 2.5 lbs. but I still used a full stick of butter (unsalted, we try to watch our salt intake). Eight hours on low and it was falling apart. The “gravy” was awesome. We ate it over No Yolk Noodles one night and shredded on buns with a little raw onion another night. I left the peppers in for the sandwiches (removing the stems and cutting them up). Sent this recipe to my brother who made it and claimed it to be delicious! P.S. 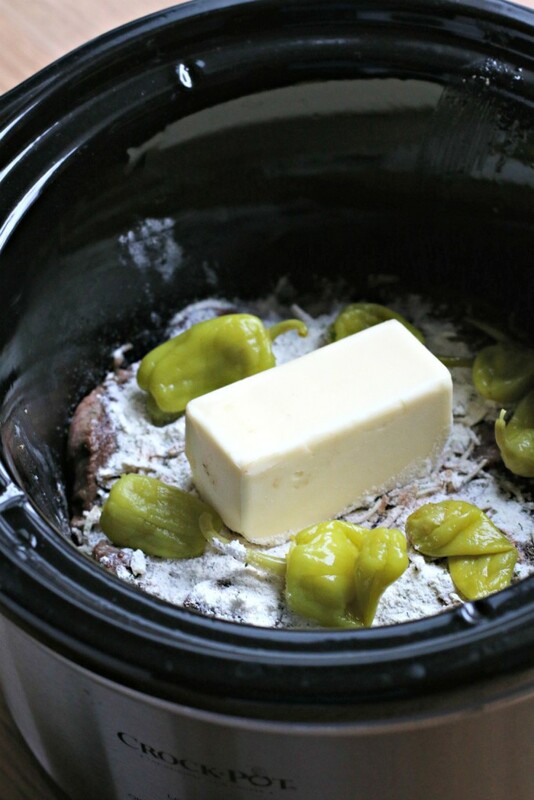 I put frozen meat in the slow cooker all the time – just make sure there is some liquid in the pot to avoid cracking. Just curious, do the pepperoncini’s make this dish spicy? Everything about it, along with the variations sound delicious and my 12 year old loves pot roast. Just don’t want to make a big roast and he won’t eat it. Made this today, and followed the recipe to a tee and it turned out amazing. I totally recommend this recipe! !!! 2 thumbs up! I slice an onion thickly and place the slices under the roast. When the roast is finished I use an immersion (stick) blender to blend the very soft onion pieces into the liquids in the crock pot and then thicken with corn starch for gravy. I’ve used both the brown gravy packet and an au jus packet and can’t tell much difference. The pepperoncini add a really nice mild flavor, not hot at all. Any way I can cook this on high rather tha low? Yep, this type of recipe would do fine on High. I’m thinking 6-7 hours on high. Do you use fresh peppers are pickled ones or does it matter? Made this with a pork roast a few weeks ago and it was absolutely fantastic! My husband and I ate the whole thing in two days! Ate it with mashed potatoes the first night, then made BBQ sandwiches with it the 2nd night! The only thing I would suggest is to use unsalted butter; it was really, really salty to me. How did it turn out with a deer roast? I use only half a stick of unsalted butter and ranch and au jus packet. It turns out just as good with half a stick! Note: I cut the butter into pats and place all over the roast after I sprinkle on the ranch and au jus packets. Can you make this with Brisket? Brisket would be amazing with this since it is a better cut of meat. Here in Oregon I have a hard time finding brisket, when I do I grab it! Ok. I’ll let you know after Christmas dinner. Sounds great & want to try with an Elk roast…rather then serving over rice or mashed potatoes can you serve it up with potatoes on the side rather then shredding the meat, serve it like a roast basically or does it fall apart too much so needs to be over something? Maybe if I cooked a little less it wouldn’t fall apart as much? Thanks for the feedback and the information about elk. I do want to try this with less butter. In fact I have some meat I was going to use for a teriyaki crock pot meal today, this sounds better! Going to make this instead. Made this for dinner and it went over big. Next time I ‘ll put in more pepperchinis. Yummy!!! Made this Saturday for my family….ALL of them went crazy over it….my daughter was eating it out of the crock pot…this is definitely a keeper!!!! I think it will be fine Chelsey! It will have a little more juice to the dish, but the flavor should be good still. I also, used a cup of water….. Epic fail!!!! I was looking at two recipes, and confused the two… Anything I should do to correct it? Kelly I think this recipe is fool proof. It should be fine! Even with the added water. I made it the other day with water and less butter, and it was still to die for. I don’t see why not Tish! It will be fine! I often don’t sear my meat. That’s a hard question, I’ve never bought that kind before. I do have to say this recipe is hard to screw up, so your best judgement. I’ve made this a few times and the family can’t get enough of it. The last time we made this we used bone in pork country ribs instead of pot roast and all I can say is OMG! Oh my goodness! The extra fat content in the pork ribs took this over the top. Fantastic over mashed potatoes. I love this recipe, really can’t beat the flavor from the butter and seasonings. Glad you like it too! Which one has less of a salty taste the auju packet or the onion soup packet. I am trying to cut back on the salt. Hi Ashley! I would check that out when your at the store (I am out of both, so I can’t check), you can always use half a packet and it would still taste great. Yes! I am actually thinking or doing this again with carrots, potatoes and onion. If the roast is frozen should i add a little water ? I think it will defrost fine without water. May need to cook longer if it is frozen though. The butter is plenty of liquid. Could I use liquid ranch instead of dry packet? I forgot to grab at the store today and wanted to cook this tomorrow. Today was the 4th time for this ‘easy – full-proof’ recipe. I use unsalted butter to cut down on the salt and add a cup of red wine to add favor and to have extra sauce to serve with the meat, garlic mashed potatoes and roasted carrots w/cardamom. This time served with a red-wine poached pear salad. I am trying this I hear it is FABULOUS!!! However, i went to the store they didn’t have spicy ranch; thought I had regular ranch of course I don’t but I do have fiesta ranch has anyone ever used the Hidden Valley Fiesta Ranch in this recipe? I’ve made this using ranch mix and au jus mix but only used 1/2 stick of butter and turned out great. Didn’t miss the other half of butter, would like to try adding some red wine next time. Do you serve the juices created while cooking with the meat? Yes! They are great over the meat and on top of rice and mashed potatoes. Mississippi chicken can I substitute beef gravy for the offer jus mix or would onion soup mix be better? I have not tried! Made me think about how I would do it if I did try. Maybe a chicken gravy packet with a ranch packet? Putting it on my must try list. I don’t think you can mess it up though! Can you use a brown gravy packet instead of the a jus packets? Since no one seems to follow the recipe I decided I would add to it as I saw fit. i browned the pot roast then cut slits in the surface and inserted about 4 cloves of minced garlic, I then added a entire jar of Pepperocinis with the juice [ 16OZ ] and sprinkled a package of dry Italian dressing mix over the top. I kept the stick of butter and slow cooked it for 7 hours. Was excellent. Great tips, thank you James. The dressing from the bottle may curdle. If you don’t have it you can always use onion powder, garlic powder and salt. Should be just fine. Can I use a frozen roast? I didn’t take it out of the freezer and was just wondering. I have a 12-oz jar of Classic Beef Gravy but not the packet. I do have the Ranch Seasoning Mix. I’m concerned about the beef gravy though. What do you think? I think it will be just fine! there will be so many juices that it won’t be very thick at the end, which is fine.